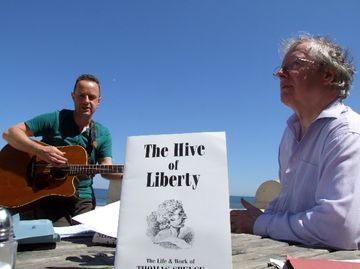 In 2010 Gary Miller and Keith Armstrong began collaborating on a series of commissioned songs about Thomas Spence (1750-1814) the noted pioneer of people’s rights, pamphleteer, and radical thinker of Newcastle-upon-Tyne. Keith is a founder-member of The Thomas Spence Trust and successfully campaigned for a plaque on the Quayside in Newcastle, where Spence was born, unveiled on Monday June 21st 2010, Spence's 260th birthday, and celebrated through a series of events including performances by Gary of such songs (words by Keith and music by Gary) as ‘Folk Song For Thomas Spence’, ‘The Hive of Liberty’ and ‘Jack “the Blaster” Bates’, as well as songs written by Spence himself such as ‘The Rights of Man For Me’. 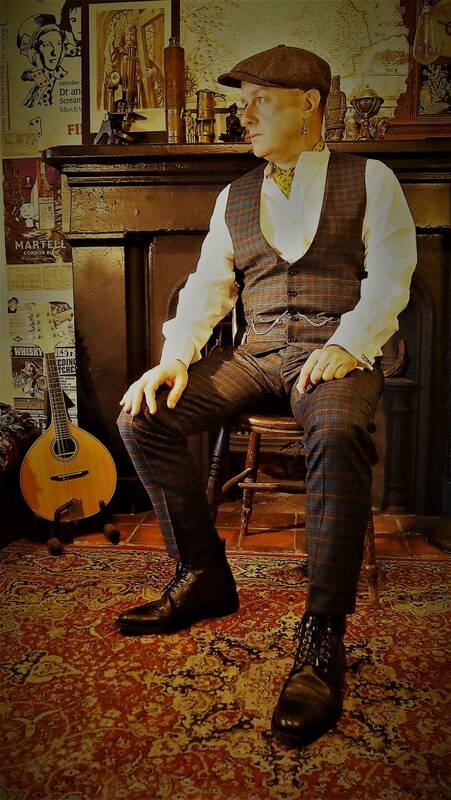 In the meantime, Gary has also written a number of songs about Thomas Spence, such as 'A, B, C' and 'Broadsides, Ballads and Battle Cries'. To date all of these songs remain unrecorded but there are tentative plans for a CD in the near future. 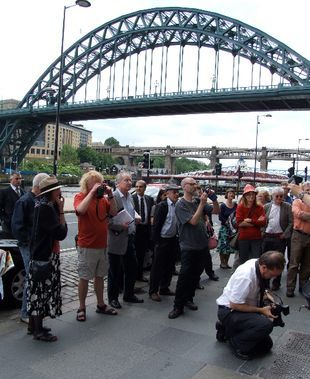 On 21st & 22nd June 2010 Gary took part in a series of celebrations centred around the official unveiling of the plaque, beginning with the unveiling of the paque itself on Newcastle quayside. 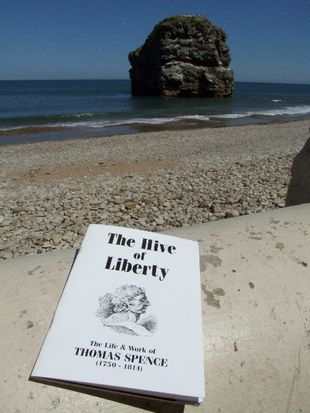 "That great free spirit, utopian writer, land reformer and courageous pioneering campaigner for the rights of men and women, Thomas Spence." 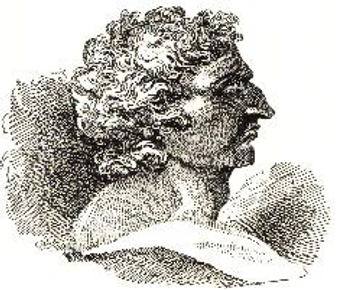 (1750-1814). "In these days of bland career politicians, Spence stands out as an example of a free spirit, prepared to go to prison for his principles - the principles of grass roots freedom, community and democracy, for the human rights of people all over the world." "This plaque puts Thomas Spence on the map for all of those pilgrims who hold human rights and political freedoms dear. It does not trap his free spirit rather it gives his life and work fresh wings." 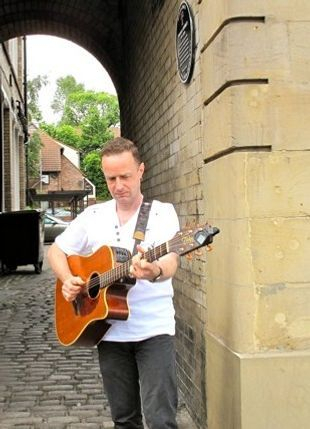 Immediately after this short ceremony, at a reception in the Redhouse near the Quayside, where glasses were raised in Spence's honour, poems were read and talks were given about Spence, and Gary performed 3 songs; 'Folk Song For Thomas Spence', 'The Hive of Liberty' (lyrics by Keith Armstrong / music by Gary Miller) and 'The Rights of Man For Me' (a song written by Spence himself to the traditional tune 'The Maid of the Mill'). 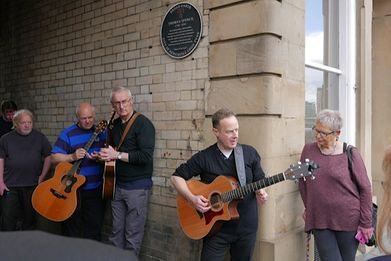 Later, at a further session in the evening at Newcastle’s Lit & Phil (Literature & Philosophical Society), courtesy of the Workers’ Educational Association, Gary again performed 'Folk Song For Thomas Spence' and 'The Rights of Man For Me' while Keith recited a further selection of poems. 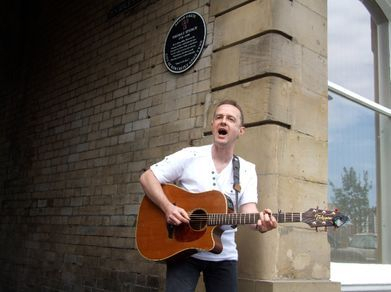 The following lunchtime, Tuesday 22nd June, Gary took part in a gathering to raise another glass for this man, who in his own words ‘dared to be free’, at Marsden Grotto, South Shields, where Thomas first chalked the phrase ‘The Rights of Man’ on a cave wall, and performed 'Jack "The Blaster" Bates' (lyrics by Keith Armstrong / music by Gary Miller) and 'Folk Song For Thomas Spence'.